DUBAI, UAE, 2017-Apr-27 — /Travel PR News/ — Qatar Airways made a host of exciting announcements to kick-start day one of the Middle East’s biggest travel show in Dubai today. At the highly anticipated annual press conference Qatar Airways announced it will be the first airline in the Middle East to launch high-speed broadband on flights starting this summer, along with a brand new graphic user interface (GUI) for improved usability and a complimentary new entertainment application for early access to thousands of entertainment options. Combined with the regional reveal of its impressive and ground-breaking Qsuite, Qatar Airways undoubtedly stole the show on the opening day of the Arabian Travel Market (ATM). Qatar Airways also surprised attending guests and international media by revealing an additional 12 new destinations to be launched in 2018: San Francisco, U.S.; Cardiff, United Kingdom; Utapao, Thailand; Chittagong, Bangladesh; Mykonos, Greece; Málaga, Spain; Accra, Ghana; Lisbon, Portugal; Abidjan, Ivory Coast; Prague, Czech Republic; Kiev, Ukraine and Mombasa, Kenya. This news comes after the airline had already announced an impressive 14 new destinations for 2017-18, further adding to the airline’s global network of more than 150 destinations. Leading the announcements was the launch of the new high-speed broadband in partnership with Inmarsat (GX Aviation). This offering heralds a new chapter in connectivity for the airline, enabling both premium and economy passengers the ability to stream content and browse the internet with the same speed and efficiency as if they were on the ground. Initially available on the Boeing 777 and Airbus 350, Inmarsat’s ‘GX Aviation’ product will offer seamless connectivity through its proprietary Global Xpress Ka-band satellite network, designed perfectly for use in commercial aviation. Qatar Airways also announced the launch of its redesigned website, set to go live in early May. The new website was developed to showcase the airline’s destinations and service, and features more than 2000 new destination and fleet images, and over 400 videos, including 360 degree videos and panoramic images. 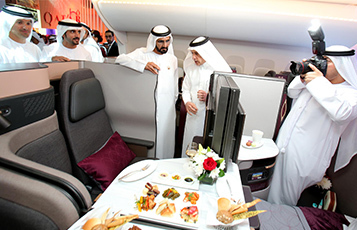 These significant announcements came on the day that the Doha-based airline proudly unveiled its new Business Class experience, Qsuite, to consumers in the Middle East for the first time. H.E. Mr. Al Baker revealed the finer details of the recently launched Qsuite at the press conference, before revealing the Qsuite in person to gathering crowds of media and VIP attendees at the airline’s stand. His Highness Sheikh Mohammed Bin Rashid Al Maktoum, Vice President and Prime Minister of the United Arab Emirates (UAE) and Ruler of Dubai and His Highness Sheikh Hamdan Bin Mohammed Bin Rashid Al Maktoum, Crown Prince of Dubai were given a tour of the Qsuite by Qatar Airways Group Chief Executive His Excellency Mr. Akbar Al Baker. Qsuite features the industry’s first-ever double bed available in Business Class, with privacy panels that stow away, allowing passengers in adjoining seats to create their own private room. Adjustable panels and movable TV monitors allow colleagues, friends or families travelling together to transform their space into a private suite, allowing them to work, dine and socialise together. These new features provide the ultimate customisable travel experience that enable passengers to create an environment that suits their own unique needs. Qatar Airways continuously revolutionises the passenger experience, enabling passengers to enjoy First Class features within the airline’s Business Class cabin. The first Qsuites will be retrofitted onto existing Qatar Airways aircraft from June onwards, at a rate of about one plane per month. The first destinations to feature the Qsuites are due to be London, Paris and New York. Each of the new seats is crafted with intricate details such as hand-stitched Italian leather and satin rose gold finishing, bringing an unprecedented level of luxury and elegance to Qatar Airways’ Business Class offering. In addition to the customisable on-board seating experience that passengers will now enjoy, Qatar Airways is also launching a customisable food and beverage concept, introducing a menu that offers a host of new dining choices – the new Business Class menu will now offer a selection of snack ‘sharing dishes’ available throughout the flight, allowing travellers to turn dining at 35,000 feet into a social experience. A wake-up Express Breakfast will also be available for those who choose to sleep a little longer by making the most of the ‘Do Not Disturb’ option available on the door of their private Qsuite. Ushering in a never-before-seen standard in premium travel, the enhancements and improved connectivity will be complemented by the airline’s relaunched superior entertainment system, Oryx One, offering a next-generation user interface that has been redesigned to make it even easier to surf content and choose from up to 3,000 entertainment options – enough to fly around the world 94 times. Even when on the ground the brand-new ‘Oryx One’ mobile app showcases the very best of Qatar Airways’ entertainment, extending and complementing Qatar Airways’ in-flight experience, allowing passengers to browse the vast entertainment content library on their own device, at their own leisure. Passengers can enjoy trailers of the latest Hollywood blockbuster releases and plan their on-board viewing before leaving the ground and even read a selection of magazines and newspapers whilst waiting to board. Demonstrating the seamless premium product experience, passengers can also make their own favourite viewing list and transfer it on-board via the ingenious addition of the Near Field Communication (NFC) technology built in to each Qsuite seat. These extensive and ground-breaking enhancements come as the airline celebrates its 20th year of operations marking two decades of growth, industry leadership and innovation. Known for introducing industry firsts, Qatar Airways is one of the fastest growing airlines operating one of the youngest fleets in the world. Qatar Airways has a modern fleet of 195 aircraft flying to more than 150 key business and leisure destinations across six continents. New destinations being launched in 2017 include Nice, Chang Mai, Dublin and Skopje. Qatar Airways, the national carrier of the State of Qatar is celebrating 20 years of Going Places Together with travellers across its more than 150 business and leisure destinations. The world’s fast growing airline will add a number of exciting new destinations to its growing network in 2017/18, including Dublin, Nice, Skopje, Sarajevo and many more, flying passengers on board its modern fleet of 195 aircraft. This entry was posted in Airlines, Flights, Travel, Travel Services, Travel Tech, Travelers and tagged Arabian Travel Market, ATM, His Excellency Mr. Akbar Al Baker, launch high-speed broadband on flights, Qatar Airways. Bookmark the permalink.